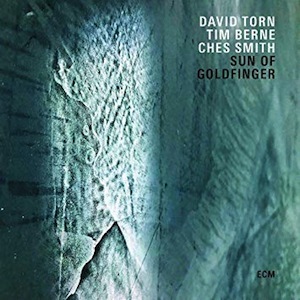 Personnel – David Torn: guitar, live-looping, electronics; Tim Berne: alto saxophone; Ches Smith: drum set, percussion, tanbou. Sun of Goldfinger is an outstanding, explorative trio composed of David Torn on guitar, live-looping, and electronics; Tim Berne on alto saxophone; and Ches Smith on drums, electronics, and tanbou. The group first played together in 2010 when Torn accepted Berne’s invitation to play a trio gig in Brooklyn, an event that got the guitarist very well impressed with the inventiveness of Smith. Let me just start by telling you that the three-song album presented here is a must-have for fans of new music, allowing elements of jazz, rock, and avant-garde to blend under scrupulously burning arrangements and engrossing impromptu creations. Torn’s “Spartan Before Hit It” is the central piece on the record, a modern symphonic marvel in every aspect that thrives with the addition of guitarists Ryan Ferreira and Mike Bagetta, super keyboardist Craig Taborn, and the strings of Scorchio Quartet, which contributes with two violins, a cello, and a viola. The song, tranquilly cinematic in its first minutes, has a rich piano underlying it and is ignited through a solid compound of saxophone-guitar exclamations, later turned into red-hot masses of sound, and a fancy rhythm that lies in-between the primitive African and the ecstatic Brazilian. The electronic effects are tastefully integrated and never feel as outsider elements. Surrounding, organic sounds penetrate deeply into our heads, extending emotions through a bright light before entering into a chilly, drone-dominant phase that paralyzes and bewilders. The autumnal landscapes are then reintegrated, with Torn’s folk gestures warming it up. It’s phenomenal to see how the structural discipline and adventurous freedom work so well together, also prevailing on the two other spontaneous tracks. You’ll find three creative individuals speaking in their own languages and fusing different elements to conjure a unique collective atmosphere that unveils all their musical intelligence. They are master colorists working from different angles of time and space. “Eye Meddle” combines guitar chords seasoned with beautifully atonal flavors, loops of several frequencies, odd percussion, and resilient grid-like sax lines that can sound furious and elastic. Halfway, look for the intoxicating psych-rock scenario mounted with a groovy hip-hop flavor running underneath. Hallucinating, this trip still offers a distorted guitar solo over a vibe-infused funky rhythm and cyclic buzzing drones emitted by guitar and saxophone. Nothing is out of place and the sound is fascinating. Concluding the album, “Soften The Blow” starts off like poetry in motion, serenading us with passive dark tones. Wavy chordal twang and measured electronic fluxes are part of the game. The conversion to chaos happens when Torn inflames his guitar with a mix of distortion and delay in a rock-centric obsession, Berne dives into extravagant in-and-out work, and Smith uses nimble syncopation to produce a snarly pulsation. Sun of Goldfinger is pure teamwork and nothing short of remarkable. Their unmissable debut album is powerful, it grabs you hard and you rise with it. Personnel – Tim Berne: alto saxophone; Matt Mitchell: piano. Last year, innovative pianist Matt Mitchell released Forage, a great solo album whose audacious material consisted exclusively of compositions by alto saxophonist Tim Berne, the man who had hired him in 2012 to play in the progressive Snakeoil band. The musical bond between the two men is so strong that a duo album was almost inevitable. Hence, Angel Dusk is now available and features eight tracks that pair Berne’s agile phrasing and resonant angularity with the perceptive, if intricate, tapestries of Mitchell. The session opens with “Perception/Reception”, which gets strong forward momentum without being constantly busy. It shapes into a lyric reflection imbued with precise movements and emotional force. At some point, Berne embarks on circular crusades, having Mitchell's regularly paced chords darkening the mood for the time they last. Even remaining enigmatic until the end, there’s light in the sharp unison lines, which also endure on the subsequent short tune, “Not Too Two”. “Exception/pest” flows with an instant liquidity. Mostly amiable in nature and exhibiting a classical-tinged artistry on the piano, the piece is temperate in its last section with a sort of rebelliousness that surfaces under the guise of explosive saxophone statements. Things are maintained hot on “Starfish Blues”, in which the swift interplay becomes massive and irreverent, and on the hyperactive “Petulance”, a recipient of ritualistic saxophone drives delivered with scorching trills in the mix and a complete command of the language. Denser harmonic progressions are adopted as accompaniment. Both “Chance” and “Snail’s Pace” take their time to evolve, embracing a melodic parallelism that, even cerebral to a certain degree, is no less interesting or provocative than the sonic outbreaks. If the former piece goes from balmy to eloquent before returning to the written section, then the latter opens with Mitchell’s mystic rainbows of beautifully contrasting notes, proceeding in 'searching' mode after Berne jumps in with a combination of intimate melodicism and rhythmic agitation. The constituent pieces of this collaborative work are extremely hard to separate in upbeat or downbeat. It’s much easier to associate their organic sounds with light and darkness due to the timbral coloring of the knotty textures. Berne and Mitchell sculpt and engrave with an absolute sense of anticipation and direction, making their set of explorations a stimulating listening experience.